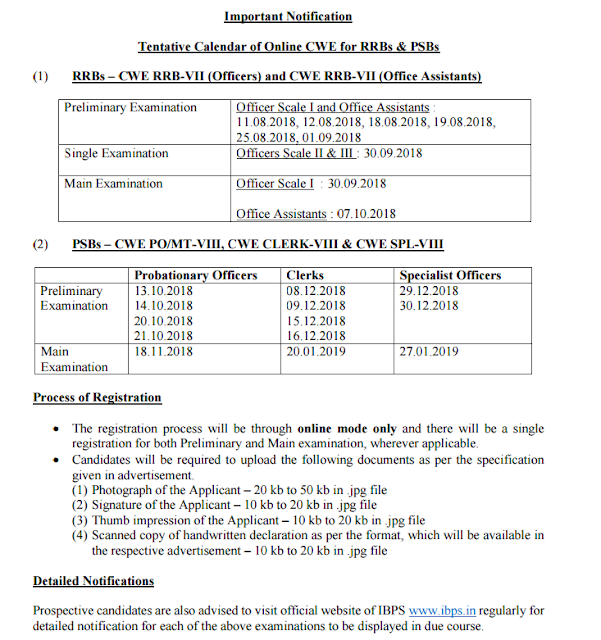 IBPS Calendar 2018-19 Examination Download PDF Online - IBPS PO, Clerk, IBPS RRB, Officer, Assistant Examination Calendar 2018-19 Released. IBPS has released online IBPS Examinationation Tentative calendar for PO, Clerk, SO & IBPS RRB officer & Asst. examination 2018.  The registration process will be through online mode only and there will be a single registration for both Preliminary and Main examination, wherever applicable.  Candidates will be required to upload the following documents as per the specification given in advertisement. (1) Photograph of the Applicant – 20 kb to 50 kb in .jpg file (2) Signature of the Applicant – 10 kb to 20 kb in .jpg file (3) Thumb impression of the Applicant – 10 kb to 20 kb in .jpg file (4) Scanned copy of handwritten declaration as per the format, which will be available in the respective advertisement – 10 kb to 20 kb in .jpg file Detailed Notifications Prospective candidates are also advised to visit official website of IBPS www.ibps.in regularly for detailed notification for each of the above examinations to be displayed in due course.